In 5-quart Dutch oven, cook ravioli as directed on package; drain and return to Dutch oven. Meanwhile, on microwavable plate, microwave bacon 30 to 45 seconds on High until crisp. 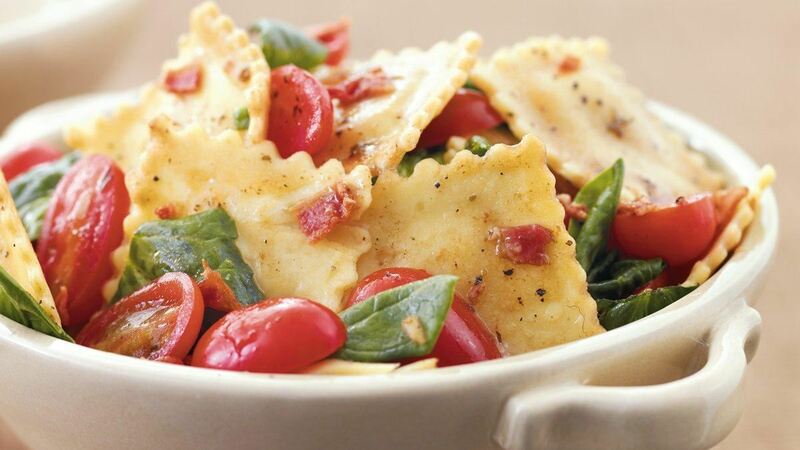 Add bacon, spinach, tomatoes and dressing to ravioli. Cook over medium heat until warmed and spinach is partially wilted. Sprinkle with pepper. Time-Saver : Buy prewashed spinach to save preparation time. Tip : Quartered cherry tomatoes or chopped plum (Roma) tomatoes can be substituted for the grape tomatoes.